GOBEKLI TEPE, Turkey, an ancient (9000 BCE) amphitheater, focuses above on the star Deneb in the constellation The Swan or The Vulture. Gobekli sits on a ridge above the Plain of Harran–turf of Moon God Nannar (aka Sin-El-Allah after Noah’s flood). Ningishzidda-Thoth, as Hermetica, says Collins, secreted Anunnaki wisdom here and developed his Tarot deck here. The wisdom of Thoth, kept alive by the Arabs, awakened the Renaissance in Italy. 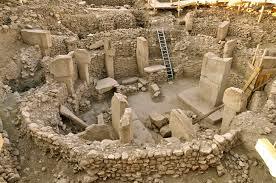 Ampitheaters like Gobekli abound in this part of Anatolia. The builders made them ovoid-shaped with stone and mortar benches that face two central monolith-pillars. 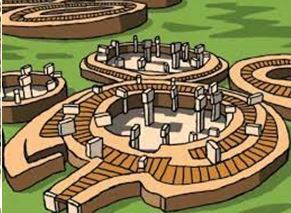 At Gobekli, the amphitheater surrounds the central monoliths stand 18-feet high. They weigh 15 -20 tons apiece and face each other across a space where a priest communed with the gods. A century after the builders made a theater, it no longer (due to precession of the equinoxes) aligned with Deneb. So they buried the theater and, along the same ridge, build a new one atop or near the old, out of date one. They built ever-smaller theaters each century, as the Earth moved off its alignment with Daneb. Central pillars in the middle of these theaters feature anthropomorphic statues. The statues’ arms wrap around them like those on Rapa Nui statues that the Anunnaki and the Capensis ETs erected with flood survivors. The builders of both Gobekli and Rapa Nui carved snakes on the statues. Snakes in the ancient world symbolized humanity’s saviors and genetic engineers–Enki, Ninmah and Ningishzidda-Thoth. Swidarians, Collins says, flood survivors from the North Mountains–Poland, the Carpathian Mountains and Belarus–came down to Turkey and got local hunters and gatherers to work for them and build these structures. Swindarians were tall hybrids with Capensis as well as Neanderthals; some of the Swindarinans had elongated heads and left traces of their DNA in human populations. Collins considers Deneb, the brightest star in The Swan and the star to which the ampitheaters orient, the home in the stars to which the old megalithic structures in Turkey, Ireland, UK and the Baltics point. Deneb points to “the exact point where the Milky Way splits into two to form The Great Rift–the Signus Rift.” Ningishzidda, author of the Mayan Calender, also said that when we aligned with the Rift in 2012, he and his collegues would assist our evolution.